Possibly the Glenn Miller Orchestra? I found this photo at a garage sale and I liked it because it was clearly a vintage photo of a big band. Upon closer inspection, I think it may be the Glenn Miller Orchestra. 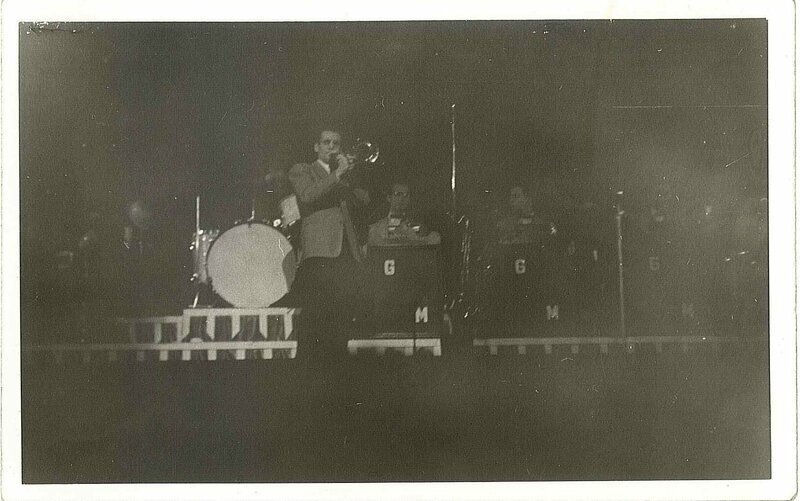 The lead trombonist looks like him, and the musicians’ big band music stands say “GM”. Any experts out there who might know? My retirement (2009) after 35+ years as an elementary art teacher in the Elyria School District has enabled me to revisit other long-held interests; chief among them the music and career of the late bandleader and American musician, Glenn Miller (1904-1944). I came across and saw your acquisition of the Glenn Miller photo as posted in your blog from April, 2012. You mentioned it as possibly being an image of Glenn Miller. Yes, it is, indeed Glenn Miller with his orchestra. From the looks of things this was taken at the Paramount Theater about 1940. As a Miller researcher and historian, this is always fun and exciting to find a ‘new’ image.